I must have a strong influence on my son because he came back from the book fair today with a stack of books on ghosts and monsters. We looked through these books today together and had a wonderful time. My favorite section from his Horrifica book was on Japanese ghosts. It is no surprise that the Japanese would have interesting ghost lore. The Japanese have some of the most wicked imaginations when it comes to ghosts and horror. Just look at the best ghost movies, The Ring, The Grudge, etc. They are all taken from the minds of the Japanese. Any even cursory look into Japanese cinema reveals a strong Japanese folklore filled with demons and ghosts. 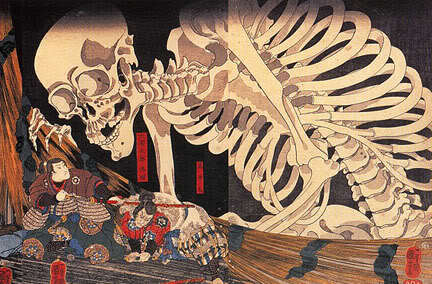 Japanese folklore is filled with ghosts and perhaps the most terrifying of these ghosts is the Gashadokuro. The gashadokuro is a ghost which is assembled from the bones of those who have starved to death. Once these bones have been assembled to make a gashadokuro, it becomes a skeleton that is over 15 ft tall and is ravenous. If it finds you, this monstrosity will eat your head. The only thing that can protect you from the gashadokuro is to run when you hear the ringing in your ears that marks its approach. Kabuki theater is filled with stories of vengeful women spirits that were wronged in life. Koizumi Yakumo collected many of the famous classic Japanese ghost stories in the late 19th century. You can find them at http://ghost.new-age-spirituality.com/japanese.html . I love the movies and stories to do with ghosts that come from Japan and China (and other Asian countries). The originals are ALWAYS way better than the American remakes (which rely on scares via noise, rather than the tension of Asian movies). Thanks for sharing! Now I want to look up Japanese ghost stories, even though I should be going to bed!